*any game you see scheduled for 3:25 could be on CBS or Fox, no matter if it’s an NFC vs NFC game or if it’s an AFC vs NFC game at the Superdome or a road game versus an AFC opponent. What matters is if it’s the weekend of a Fox DH or CBS DH. The leak you are seeing on the interwebz, courtesy @thesaintszone is my Mock Schedule #21. Is this the unofficial official schedule? It is the official official. What a monumental waste of time. None of yours was correct. Besides, the schedule release isn't particularly interesting as we know who will be on it, just not when. The “when” is the most interesting part, Jake. I like to travel to road games, and since I live six hours away, I “travel” to home games as well. I try to see about four games a year, or one a month. The schedule release allows me to plan ahead, which is almost as fun as the trip itself. There you have it, Jake. Now kindly go f*ck yourself. I've probably wasted more time this week watching kitchen nightmare on YouTube. I go to away games too, but making 44 mock schedules doesn't help at all, especially when none of them are correct. Jake, why would you come in here and sh*t on something I like? Are you a miserable f*ck, or do you just play one on TV? You posted it for public consumption and I commented that it's a waste of time. Calm down Rainman. Jake, just so we are clear, I never expected to “get one right.” Do you even know what the odds would be of me hitting a perfect mock schedule? I would not only have to get the opponent and the week correct, but I would also have to guess the kickoff times correctly as well. I created 44 mocks for the good people of SaintsTalk to enjoy, why would this trigger you? Are you upset because you don’t know how to mock a schedule? All you have to do is ask, Jake, and I’ll gladly explain the process to you in a way you can understand. Do you even know what the odds would be of me hitting a perfect mock schedule? Yes, that's why I said its a waste of time. I created 44 mocks for the good people of SaintsTalk to enjoy, why would this trigger you? Who enjoys it? Everyone knows who is going to be on the schedule and where by the end of the season. Save for two teams, we know who is going to be on the schedule for the next several years. The goal for me isn’t to hit a perfect schedule, Jake. The goal is to look at different possibilities of how the schedule could unfold. Those 44 mocks achieve that goal. Look at the first page of folks who say they look forward to seeing my mocks. Look at the upvotes. When someone throws hatred your way, there has to be a reason, and I believe your reason is you don’t know how the process of putting a schedule works, and I do, and that bothers you. Instead of researching how a schedule is put together, you just spew negativity. My guess is (from the Rain Man reference) you are over 50 years in age and have a mental block in regards to learning new tasks. I would encourage you to never stop discovering new processes and continue asking questions. There is still time to re-invent yourself, not just once, but many times. It's not "hatred", that's silly. I simply said it was a waste of time. As I said, everyone knows who will be on the schedule years in advance except for two NFC teams which are based on the Saints' finish. Anyone can make a schedule. My guess is (from the Rain Man reference) you are over 50 years in age and have a mental block in regards to learning new tasks. Nope, under 50, but this is a fancifully defensive theory. In that case, every post you’ve made is a waste of time. You could make an argument that this entire message board is a complete waste of time. So why does TigerDroppings continue to exist? Because it’s a great way to pass the time. Creating mock schedules is a fun way for me to pass the time. Just like watching Rain Man was a good way for you to pass the time. You gained nothing from it monetarily, but you did garner some utils of satisfaction, which is just as important as far as I’m concerned. Prove it. 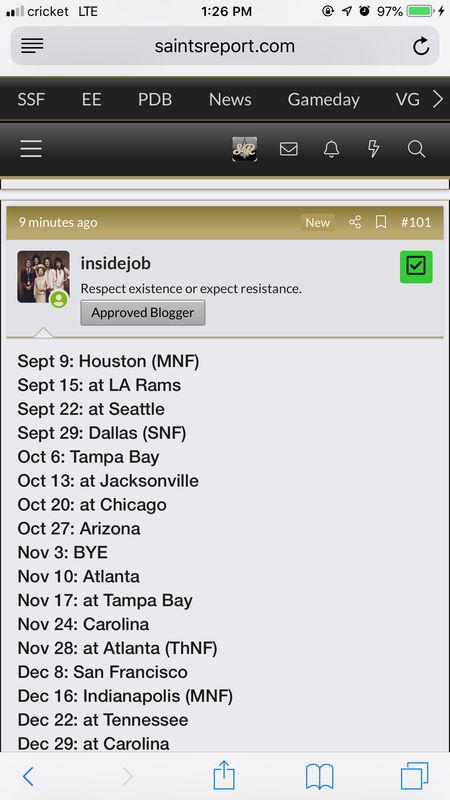 Create a 2020 schedule for the New Orleans Saints within 24 hours.